Getting your mane dyed and colored at a salon is an investment—you're relying on the colorist's technique and skills, as well as the salon's own products to give you the exact hair color you want. If you plan on trying one of these hawt 2019 hair color trends, scroll below to see which salon will fit your budget! Ed's Note: Rates from each salon may vary once your hair has been assessed since it depends on your mane's texture and length. Bangs is able to create those unique hair colors you always see on Korean celebs! And you can be sure that no matter what hue you get, your tresses won't be left feeling dry and brittle. You can get a full pampering sesh at Benibana when you get your hair colored here! They also offer nail, spa, and makeup services that can be done during or after your treatment. Each member at Vivere Salon is trained in the Vidal Sassoon Academy. With their understanding of hair, they'll be able to create a customized hair color (and haircut!) that will flatter your features! From highlights to tints, David's Salon has a wide variety of hair color brands and products you can choose from so you can get the best one to suit your hair's texture. This French concept salon combines hair with food. With a café built inside the salon, you'll be able to fully enjoy your stay! For example, you'll be able to get your nails done or eat and drink while letting your hair color work its magic in your strands. Their hairdresses can work wonders on all hair types, especially short hair. They've mastered coloring and toning short locks so you'll never have to worry about the dye job looking chunky! For edgy, yet werable hair colors, visit Marqed Salon! Its Creative Director and owner is celebrity hairstylist Mark Rosales, who's styled and touched the manes of Gabbi Garcia, Lovi Poe, Juliana Gomez, and many more! Looking to give your hair a complete makeover? HairMNL Studio is the place to go to. Aside from offering hair coloring services, they also have treatments for damaged locks, dandruff, and thinning strands! One look at the salon's Instagram account and you'll instantly understand why so many celebs get their tresses cut and colored here! They've mastered creating the most dreamy balayage looks, classic dye jobs, and rainbow-colored hair! They also offer free consultation before you actually avail of their service so you can estimate how much you'll need to shell out. 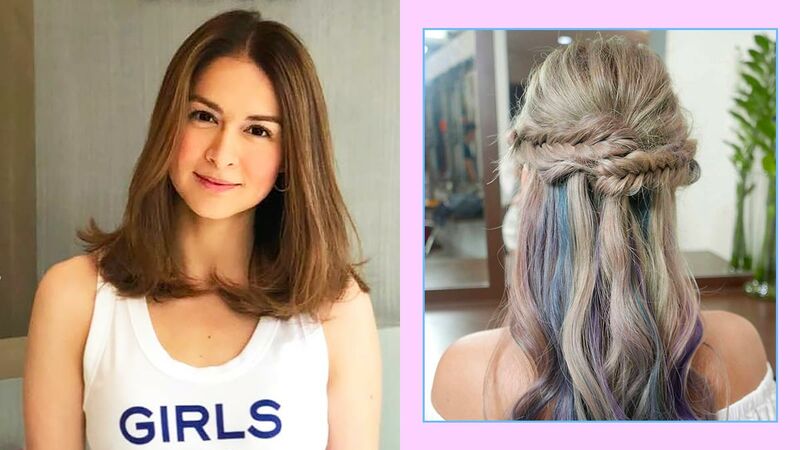 This salon, which is owned by celeb hairstylist Celeste Tuviera, is where famous peeps such as Maine Mendoza and Marian Rivera go to get their tresses snipped and dyed! Celeste is renowned for her technique and creativity when it comes to transforming hair. With their highly trained hairstylists + colorists, and innovative techniques, you can go to Basement Salon if you want the whole ~*salon experience*~. They know how to cater to your hair's every need. This Japanese-style salon offers various services for not just hair but your nails and lashes, too! Each member is highly trained in their respective fields so they can provide clients the best in beauty pampering.